Food enthusiasts Sunday got to taste new varieties bred by Johnny's Selected Seeds, grown locally and cooked by Maine chefs. UNITY — Audrey Bemis tasted a small piece of homemade bread topped with a dab of ricotta cheese and Valen-Thyme Jam. 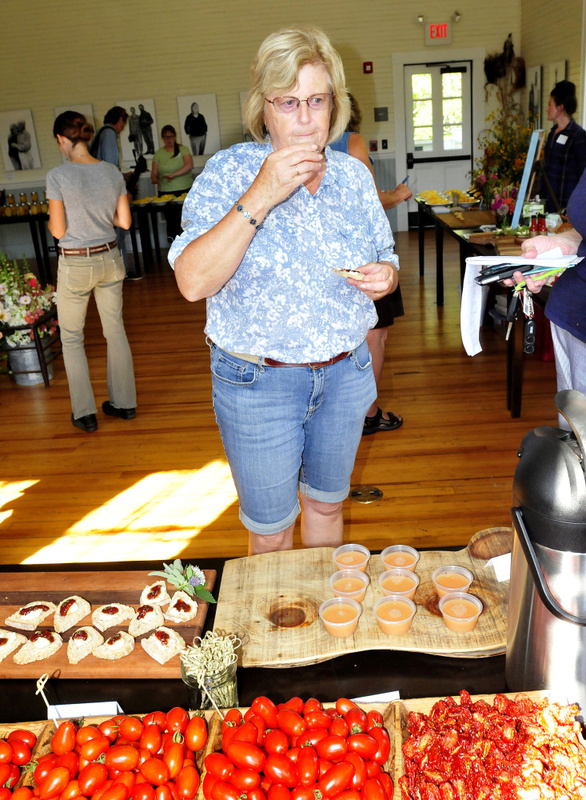 The jam, made with a new variety of grape tomato offered by Johnny’s Selected Seeds, was on display and available for tasting Sunday at the second annual Seed-to-Table Variety Tasting at The Unity Schoolhouse, the site of the Unity Food Hub on Route 139. Plant breeders, growers, chefs and local food enthusiasts took part in the event, hosted by Johnny’s and the Food Hub. 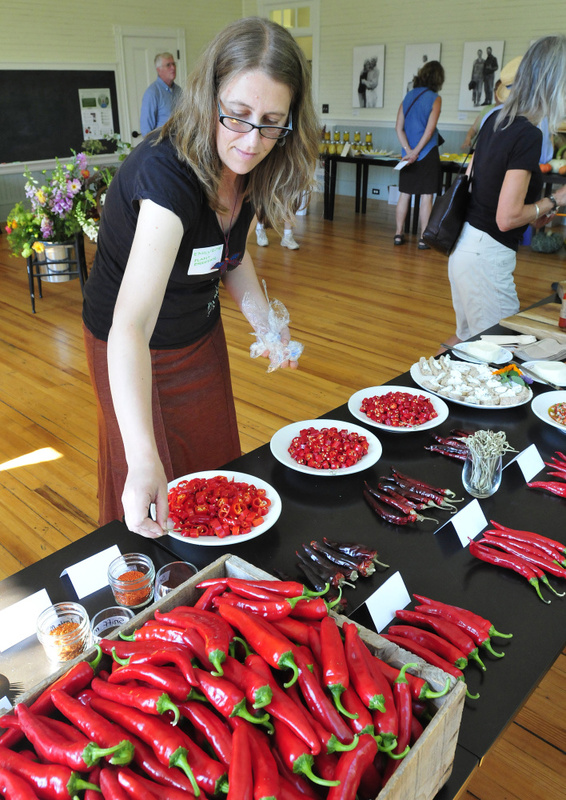 Two large rooms in the renovated schoolhouse were arranged with tables of colorful squash, tomatoes, onions, peppers, greens, cucumbers and other vegetables beside samples of dishes cooked up in the kitchen by chefs from popular eateries: Melissa Kelly of Primo Restaurant in Rockland, Frank Giglio of Three Lily Provisions, of Thorndike, Jenn Legnini of Turtle Rock Farm in Brunswick and Morgan Kerr of Resurgam Hot Sauce, of Portland. 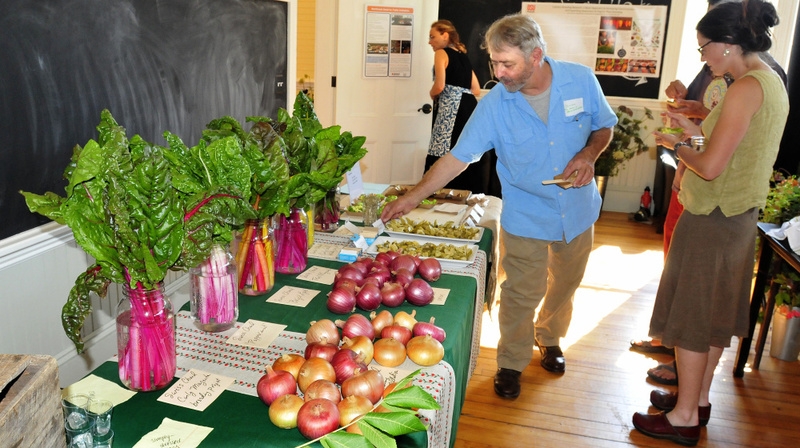 Farmers and growers, besides Johnny’s, included Ben Rooney of Wild Folk Farm in Benton, Victoria Marshall of Dorolenna Farm of Montville, Courtney Williams of Marr Pond Farm in Sangerville, Nate Drummond of Six River Farm in Bowdoinham, and Legnini. The bright, airy schoolhouse with hardwood floors and tall windows was decorated for the harvest with produce displayed in glass vases and large bouquets of flowers placed throughout. Emily Rose Haga, a tomato and pepper breeder for Johnny’s, said she and others try to develop flavorful, beautiful, disease-resistant and well-performing varieties. Sunday’s event was fun because breeders had the opportunity to work with local growers and chefs, and visitors got to taste test, she said. Haga, 33, who holds a master’s degree in plant breeding and a bachelor’s in science and horticulture from University of Wisconsin at Madison, said the newly released Valentine grape tomato that Bemis tasted is high in lycopene, a red carotine pigment that is a powerful antioxidant. The lycopene pre-breeding work was done by Majid Foolad at Pennsylvania State University, according to Haga. 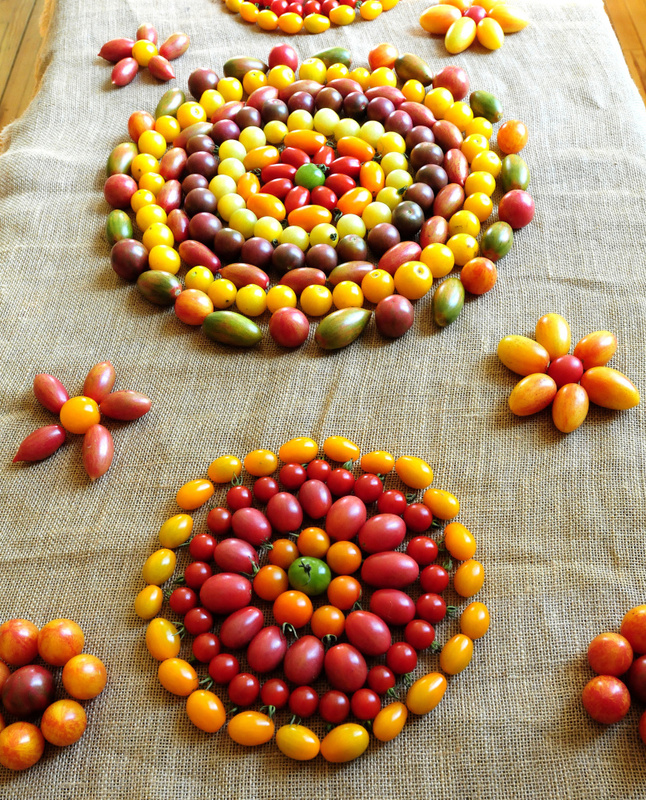 Rob Johnston, the breeder at Johnny’s Selected Seeds, used the improved high lycopene germplasm from Majid Foolad to make Valentine. Haga took over Johnston’s breeding program to help finish the testing and preparation for seed production and launch in Johnny’s catalog this fall. A Wisconsin native, Haga said she enjoys working in central Maine. The Food Hub collects, markets and distributes Maine-grown foods throughout Northern New England. Johnny’s sells seeds around the U.S. and Canada, as well as in Europe and Asian countries and has three locations: a marketing sales office in Fairfield, a seed storage, packing, shipping and distribution center in Winslow, and a research farm where Haga works in Albion. Judy Ottmann, of Belfast, nibbled on a flax cracker with roasted acorn squash, scallop salt and garam masala, an Indian spice. Ottmann’s son, Henry Ginsberg, and his partners, Morgan Kerr and Thomas Tutor, own Resurgam, a Portland-based business that makes hot sauces, and were displaying Original Leek, a red hot pepper sauce made with leek. People were tasting the sauce by itself and on a piece of bok choy with ricotta. “It is a lacto fermented hot sauce,” Ginsberg said of the sauce, available at cooperatives in Belfast and Portland, as well as at Otherside Delicatessen in Portland. 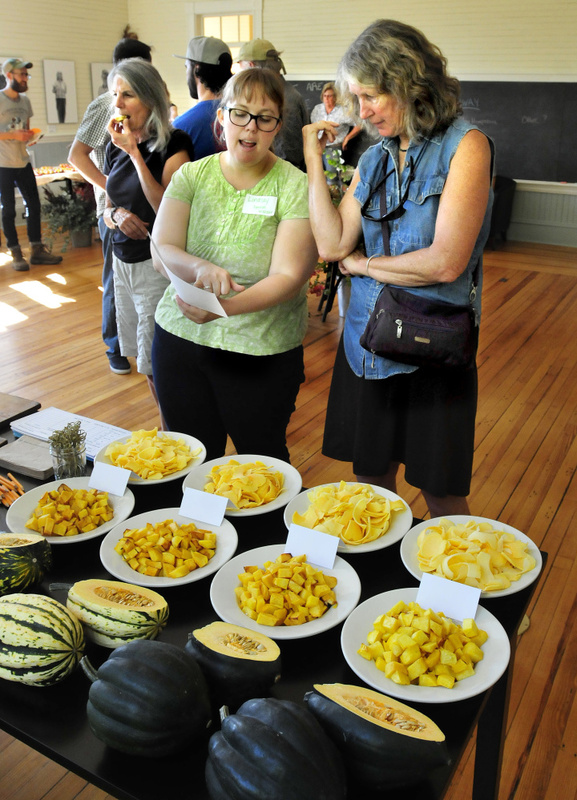 Meanwhile, Audrey Bemis and her husband, Raymond, of Harmony, who are gardeners, perused varieties of squash displayed by Lindsay Wyatt, Johnny’s squash breeder who helped organize Sunday’s event with Colleen Hanlon-Smith of Unity Food Hub. “It’s very good and it’s very interesting to taste the subtle differences in squash plants,” she said. Wyatt said organizers last year put together the event in a short period of time, so it was somewhat last-minute. “This year we’ve had an entire year to plan, which is great,” she said.